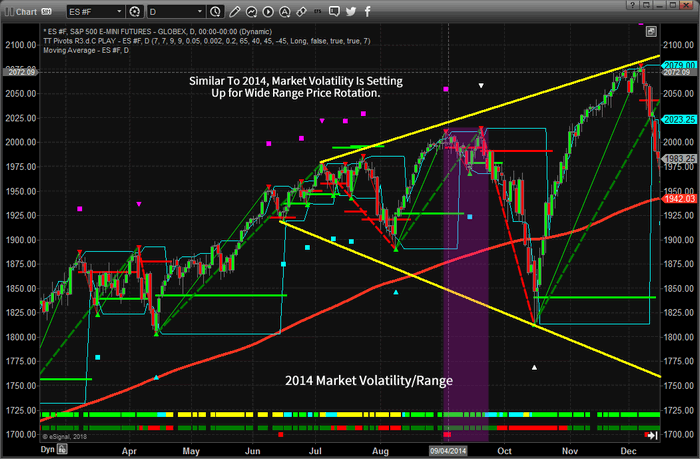 Volatility setting up like 2014/2015, Get ready for some interesting range rotation and price swings. Our recent research shows that the current US markets are setting up for what could become a very interesting price range rotation as well as increased volatility. Our team of researchers at Technical Traders Ltd. have identified a number of key elements that appear to be in place similar to 2014/2015 where the market setup an initial deep price rotation, followed by a deeper price rotation only to end with an advanced price rally on the news that the US Fed would continue buying US debt. Let us take a look at the 2014 price activity first. 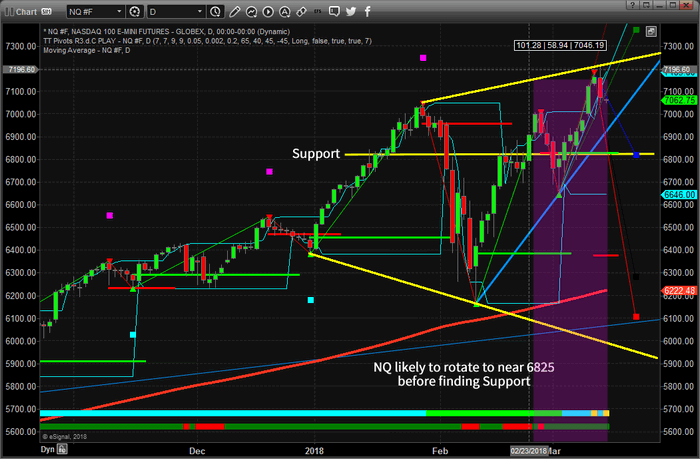 You may not be able to see the similarities like our team of researchers, and I will confess, these charts have a lot of analysis on them making it a little noisy and hard to sort through, but if you focus on the September 2014 date range, you may notice a similarity to right now in the use markets (primarily the NQ). The focus of this article is to alert you that the market dynamics are evolving quickly and you need to stay aware of the changes as they happen. There is a huge amount of capital at play in the US markets and if our analysis is correct, our advanced price modeling tools will assist you in understanding what to expect in the near future. This next chart shows us the ES (S&P) chart as of today. It is clearly a different setup from the 2014 price setup – but still similar enough for our modeling systems to catch this event. The volatility range of price is increasing in a sideways channel. This could be a good thing for traders like us. The volatility could present some real issues for trend followers like Hedge Funds and other modeling systems as they are not likely to see this price pattern setting up. We believe the ES will rotate lower over the next few days to attempt to retest support near 2660 before attempting another short rally likely ending near, or just above 2800. This would represent a failed price rotation with a new double top or higher high price level very similar to the second top near the end of September 2014. We believe this second top could produce another deeper dive in prices sometime in early April 2018. 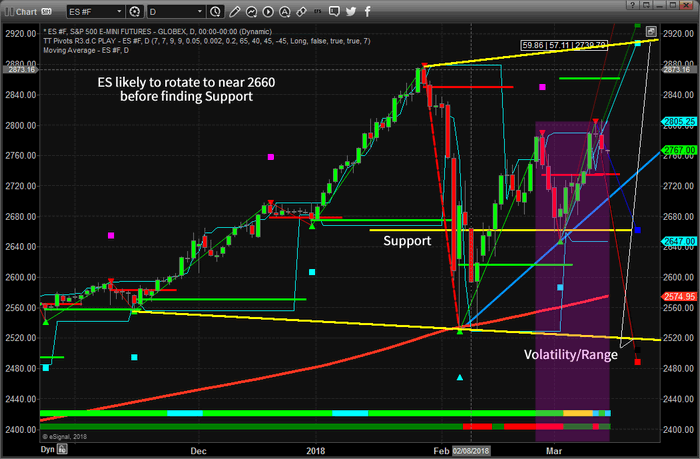 Still, the 2660 level is support and we would have to be cautious near those levels. 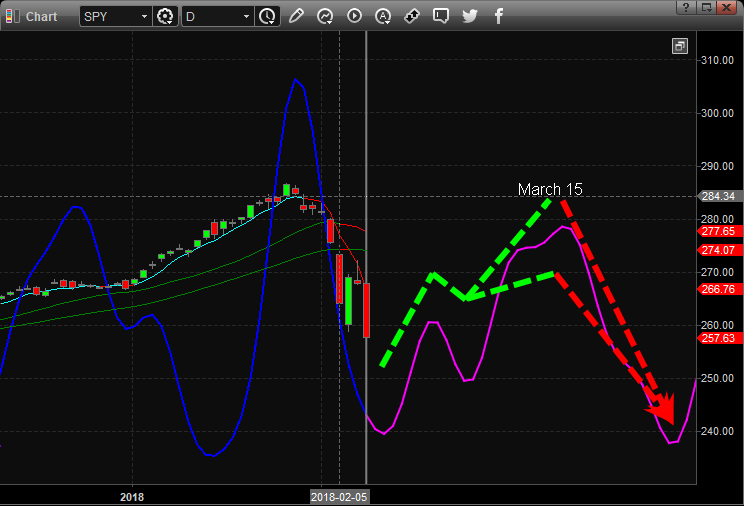 This next chart is the NQ (NASDAQ) and is showing a pattern that is much more similar to the 2014 ES chart. Support at 6820 is our critical price level and we are expecting a downside market price move immediately to retest this level as well as the upward price channel (in light blue). You can see the range expansion levels drawn in YELLOW and if you study this price rotation to the 2014 price chart, you’ll see some strange similarities. What is happening is that price is lacking direction and is attempting to hammer out peaks and valleys in an attempt to find support and resistance. The chance of a deeper price move as well as increased volatility is quite high the further this pattern continue to form. Any price move lower will likely cause the VIX to increase back above 20 and any price swing below 6600 on the NQ will likely cause the VIX to spike well above 25 again. As you can see, the downside price volatility range is near 5900. In fact, we called this rally nearly to the day over a month ago completing the bullish outlook portion. Now, the question is if our current analysis and our 6-week old prediction are correct with a big selloff. See this near perfect stock market prediction we posted the day the market bottomed! Our Adaptive Dynamic Learning (ADL) price modeling system is showing the VIX is setting up for a massive increase over the next two to three weeks. 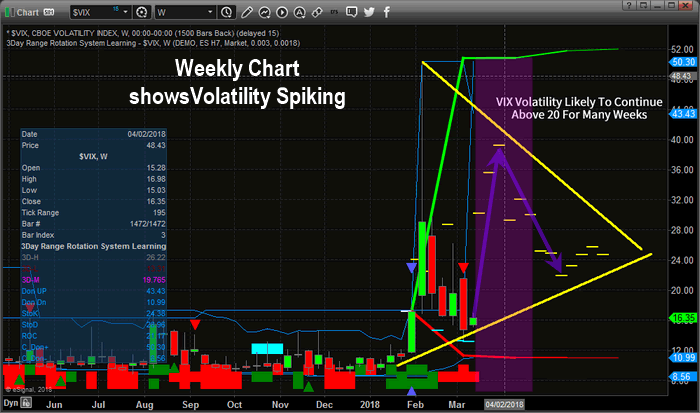 VIX is currently trading near 16 and could spike to as high as 40 within just a few weeks. The only way the VIX could attempt a move like this is with a moderately deep downward price move that would take out or test our support levels. This is part of the analysis we conduct on a Daily basis at www.TheTechnicalTraders.com. It is not just about one or two charts – we look at all the puzzle pieces to see how they all fit together to give us a very clear picture of what is likely to happen in the future. This could set us up for a good short volatility trade much like the last one in Feb where we shorted UVXY for a quick 42.5% profit. Want to know what you should be trading and how you can profit from these setups? First thing to do is to understand this is a “trader’s” market and that you probably need some help understanding these moves. Second thing to consider is how will you identify opportunities from this move while protecting your investment capital? The last thing to consider is if http://www.thetechnicaltraders.com/#video is the right solution to assist you moving forward to help you navigate these markets and stay aware of these opportunities? We believe our research is as beyond compare. We don’t believe you can find any other firm that can accurately predict what is going to happen in the future and that our advance price modeling systems and predictive analysis models assist us in keeping our clients keenly aware of future moves and relatively safe from unexpected events. Want to know how we can help you, visit www.TheTechnicalTraders.com and review some of our recent research reports and see how well we’ve been nailing these market moves for 2018. We hope to see you in our members area so we can share more insight with you.